Help build a foundation that will last a lifetime. ​UOO transition homes are the key to ending the orphan crisis in Ukraine. They build a foundation that will last a lifetime. Ukraine Orphan Outreach gives orphans a place where they can be part of a family again. A place to grow, laugh, learn, be safe and do all the things a valued family member should do. Our aged-out orphan residents are cared for by a house parent. They live in a caring, loving, secure family environment where their needs for food, health, shelter and education are met. More importantly, orphans who were once abandoned have a place where they know they’re not alone. They have a place to belong in a family. You have made all that happen by becoming a sponsor. For only $35 per month you can build the foundation these children need! Please consider changing the world for just one by sponsoring an aged out orphan. Visit our Facebook album to learn more. 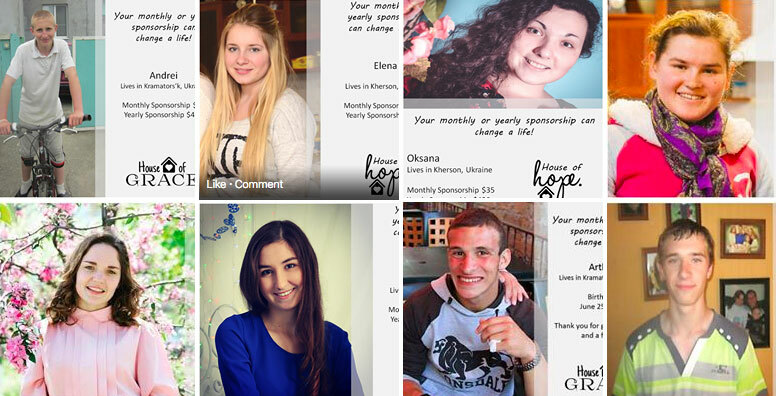 Around Ukraine, UOO provides loving homes for graduate orphans who have opted to live in our communities. Their basic needs of food, health care, shelter, and education are provided for in our transitional homes. By sponsoring an orphan graduate through UOO, these kids who were alone and abandoned can now thrive in loving families. They have the opportunity to become self-sufficient and integrate into a supportive community. Their spiritual & emotional well being has a place to grow and thrive. Accountability: Where does your gift go? ​When you choose to sponsor an orphan graduate, you have our guarantee that 100% of the sponsorship goes to meet their needs. Sponsorship funds are never used for organizational operation costs or earmarked projects. Here is a breakout of how your gift is used: Cost breakdown for sponsorships based on average & at full capacity. Join the cause and share this important message with your family, friends and co-workers. Thank you!